Dirty glass and surfaces don’t stand a chance against Powerized® Glance. Get a spot-free shine the first time with the heavy-duty performance of Powerized® Glance glass and surface cleaner. Glance powerized glass and surface cleaner performs better than the leading brand of glass cleaner with its ability to leave a clean, streak- free surface. Glance® Powerized® is ready-to-use on glass and other surfaces. Leaves a brilliant shine on glass, mirrors, sinks, countertops, stainless steel and many other washable surfaces. 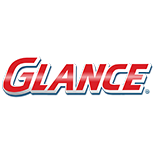 Glance® is the market leading brand in the janitorial and housekeeping market. Trusted for decades and admired for its quick drying and streak-free shine.